I'm Not a Monster at Heart! 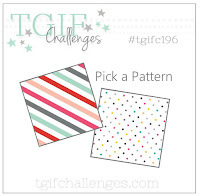 TGIFC #196, which required the use of pattern paper (I used two!). Always Fun Challenge #95 which required the use of monsters or fairies (a dragon is a monster in lots of fairy tales). Retro Rubber Challenge Blog #103 which required the use of ribbons or bows, and a stamp older than a year (I bought mine back in the early 2000's, but don't know the exact date). 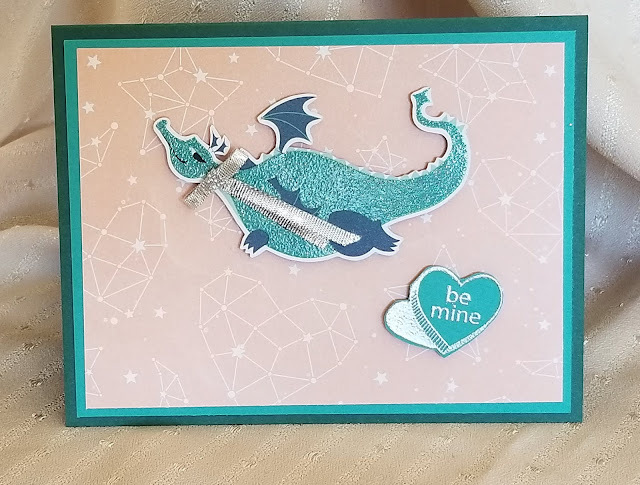 I envisioned a dragon flying through the sky, so I went browsing through all my Stampin' Up! Designer Series Paper and found this beautiful pattern with constellations on peach paper, many of which were heart shaped. Perfect! The only dragons I have is another Stampin' Up! paper called "Myths & Magic" with LOTS of dragons, and luckily one was in a flying pose. So I cut him out with his tiny little wings and horns. He was mounted with tiny bits of adhesive foam strips onto the constellation paper. I had matted the constellation paper with Bermuda Bay cardstock onto the card base which is Tranquil Tide. For the Valentine message, I found my old, but underused candy message stamp, which I inked with Versamark, then stamped onto a scarp of the same paper I used for the mat. After sprinkling with detail silver embossing powder, I heat set it, then fussy cut out. It was mounted on the card as if the little dragon and dropped if off to my granddaughter below. To make the dragon seem even more in flight, I tied a tiny silver ribbon bow for his neck, and left long streaming tails as if they were being blown by the wind. 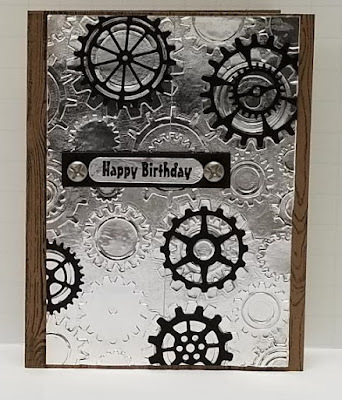 I'm sure she will like the card - it has all her favorite themes! The need to cut out the dragon and heart is the reason I am rating the difficulty of this card as a "2" out of a possible "5". This is just lovely, Donna. I think your dragon-loving, stargazing granddaughter will be well pleased. Great choice of paper - isn't it amazing what the stash sometimes provides? Thank you for joining us at Retro Rubber Challenge again. Oh wow! Your granddaughter is going to LOVE this!!! Great idea and use of designer series paper. Thanks for joining TGIFC this week. Love the colors you used!! adorable card!! 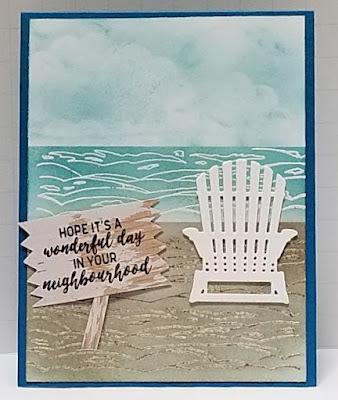 Thanks for playing along with us at the Always Fun Challenges Blog! 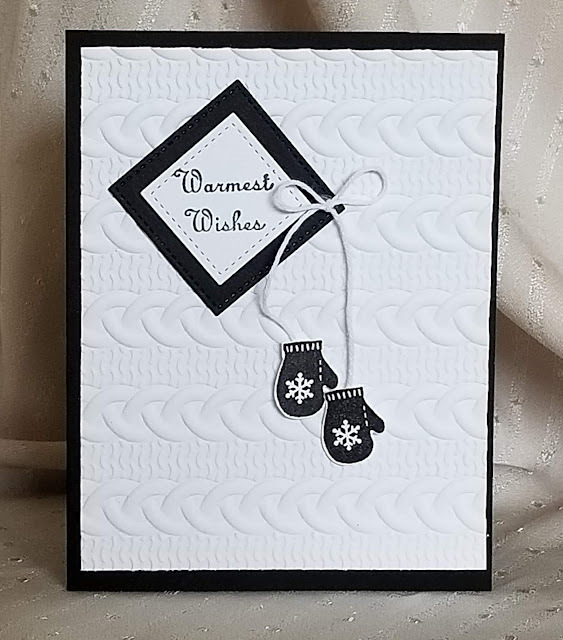 Wow what a great card for your granddaughter! I am sure she will enjoy it :) . Using the ribbon around the dragon's neck is a fun touch. Thanks so much for joining us at Retro Rubber!